Dubai: Dubai World, the government owned conglomerate will sign the final deal on its nearly $25 billion debt restructuring deal with its creditors next week, said Shaikh Ahmad Bin Saeed Al Maktoum, chairman of Dubai’s Supreme Fiscal Committee and Chairman of the conglomerate, yesterday. The company had secured 100 per cent support for the debt restructuring from its creditors following prolonged negotiations. 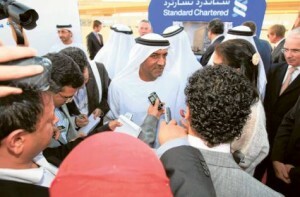 Commenting on the prospects of asset sales by Dubai World to manage its debts, Shaikh Ahmad said the group is under no pressure to sell its assets. “We are not facing any pressure to sell Dubai World assets. We have a period of eight years. Always the question is asked, is an asset up for sale? Anything can be sold if the offer is good and tempting,” he said. The bank reported more than $400 million profits from its UAE operations last year and said the revenue and profit growth is a testimony to the improving business environment in the country. Standard Chartered officials said yesterday that capital inflows from the countries that are affected by the political turmoil in the region will benefit the UAE’s economy. “There is going to be [capital] flight to stability in the region. The UAE in general and Dubai in particular is going to benefit from it. I think it is already happening,” said V. Shankar, CEO, Europe, Middle East, Africa and Americas, Standard Chartered Bank with out giving specifics of capital inflows. Apart from the capital inflows, Shankar said post crisis, Dubai is experiencing a terrific pick up in some of its key industries such as transport, tourism and trade. Bankers in general feel that refugee capital from around the region is going to boost the economic prospects of Dubai with potential recovery in some of the depressed asset classes such as real estate and asset classes. Last month Gary Dugan, Chief Investment Officer and Acting General Manager, Private Banking, Emirates NBD said the the premium segment of Dubai’s property market could get a boost from refugee capital inflows from countries that are facing political turmoil.